Cairo, Nile Cruise, Luxor, Aswan, Sharm El Sheikh . Explore the history of the ancient history of Egypt Royal on a custom Egypt tour package that takes you from the Great Pyramids to a luxury Nile river cruise with your own private English-speaking guide. Begin your Egypt travel adventure with an exclusive tour of the astonishing Great Pyramids and Sphinx. Your 11-day adventure includes private access to the Egyptian Museum of Antiquities to view the iconic Tutankhamen exhibit with a certified Egyptologist guide. The private custom tour continues with a luxurious cruise down the famed Nile River. Along the way, explore the Karnak and Luxor temples on the East and West banks of Thebes, the ancient settlement of Edfu, Kom Ombo, the city of Gold, and Aswan. Continue your travels to a new red sea adventure in Sharm El Sheikh before concluding your tour in the legendary city of Alexandria. This customized Egypt tour includes all accommodations, private guide, private vehicle, private driver, all internal flights, entrance fees, taxes, and much more! Your safety is our number one concern. You can relax during your trip with our 24/7 support and expert local guidance. Check the itinerary to learn about this tour. To find out more about this Egypt 11 Day Tour, or any of our other Egypt tours, please feel free to contact us at any time. Enjoy a customized Egypt tour with a private Egyptologist guide, driver, traditional Egyptian cuisine, and all internal flights. We will personalize your tour for you to suit your needs and schedules. Avoid the crowds with exclusive access, your own private guide & private vehicle during your tour around the Great Pyramids. Learn the history of Luxor and its monuments during a private tour to the Valley of the Kings and Karnak temple. Sail down the Nile on a three-night river cruise on board the luxurious Sonesta St. George. Wind your way around scenic Aswan islands on your own felucca sailboat with your private guide. Visit Abu Simbel temple with your private Egyptologist & private driver. 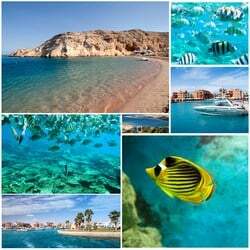 Explore the Red Sea and Sharm El Sheikh in a private adventure. Discover the city of Alexandria in a private tour to Catacombs of Kom El Shugafa, and Bibliotheca Alexandrina. Stay in safe, comfortable and luxurious hotels including Le Meridien Pyramids Hotel, Sonesta St. George Nile cruise, and luxurious Fairmont Nile City Hotel.